Grepolis can be considered a 4X browser game. It requires a player to Exploit resources, Expand their cities, Explore the oceans, and to Exterminate opposition. Many of these basic functions are familiar to many players, however this section of the Wiki will help those not familiar with this type of game, to become more familiar with it and to help with those first steps in playing Grepolis. As well, new players should look at the Guidance Portal for great guides that are available for starting out. Timber Camp Gathered in the Timber Camp. Quarry Gathered in the Quarry. Silver Mine Mined in the Silver Mine. Temple Generated in the Temple. Farm Fed by the Farm. Academy Generated in the Academy. All of your buildings, units, spells, and research will need some or all of these resources. Once you build the basic level for the timber camp, quarry, and silver mine you will begin to receive those resources automatically. The rate at which you generate those resource will depend on your island type. Divine Favor will only begin to accumulate once you select a god to worship in your city. The higher the level of your Timber Camp, Quarry, Silver Mine, and Temple the more quickly you will gain resources. Because resources are generated automatically, they will continue to accumulate even when you are not logged in to the game. In order for resources not to be wasted or lost, it is important to make sure you have room for the resources. You can ensure this by keeping your Warehouse large enough to store all of them. Divine Favor is always capped at 500 regardless of the size of your Temple or Warehouse. You can see how close you are to reaching your warehouse cap in the upper righthand of the screen. Now that you're starting out in the world, your main concern over everything else will be: Resources. When you first look at your city you will not have any resource buildings built. Getting those built will help to start generating more resources. At this point in the game, Divine Favor is not needed. Expanding your resource production buildings is the main concern for a new player. Remember to make sure that you have space in your warehouse to hold all of the resources though. Building new buildings and increasing the size of existing ones will take up population. Since all of the buildings except for the Farm and Warehouse require population, you will need to ensure that you have enough free population available. You can increase the amount you have by increasing the size of your farm. At this point, your city will be starting to look like a good target for others to raid you for resources. A nice feature of the Warehouse is that it will protect 100 of each resource for each level you build it to. This will help in denying those greedy neighbors from taking your resources. Because your city is starting to look more and more attractive to other players, you will want to begin creating some troops to help protect your city from attacks. The basic unit for this is the Swordsman. In order to begin building troops, you will need to build a Barracks. This can be done fairly quickly as it only needs a few low level buildings to be built. As you begin to build troops, you should also begin to take over more Farming Villages so that you can gain resources from those as well. The more you have under your control, the quicker you can build your city and army. Once you reach a stage where you feel comfortable with being protected and not having to worry about raids, you should consider finding a strong alliance in your local area to join. There is strength in numbers and having allies will greatly assist in becoming a great player. If you decide to join an older world, you will likely be dealing with players who are much further ahead in the game. A player in this situation will need to find a balance between defending their city, and generating resources in order to grow and expand. Many players will raid cities under 3000-4000 points, so defensive troops are a must. The stronger your defence is the better you will be when you come out of Beginner's Protection. Part of your defence should include building the City Wall, as well as having defensive troops. Remember to keep an eye on your free population to make sure that you can still increase resource production as needed. Another good strategy for keeping from being attacked is to request to join an Alliance in your area. In the later stages of the game, alliances will want to make sure that you will be able to defend yourself and continue to grow and expand. Each alliance has different requirements so you will need to find out what those are. Eventually, your city will become large enough that you will be able to expand to a new city. Before you begin to expand your cities, you should make sure that you have adequate defences in place. It is a common mistake to go off and found a new city and leave your original city empty or defenceless. A good strategy would be to invest in creating a highly defensive city in order to protect yourself. Once you have managed to prevent all attacks on your city, you can then begin to look at other cities to take over. The advantage to this strategy is that you will then have a strong defensive city which can help aid your other city if needed. The City Overview is where you can view your city and see what buildings you have built. You can also access the various functions that each building can provide with a click. So you can click on the Barracks to build troops, or the Marketplace to make trade offers. 1 Senate In the senate, you can build or upgrade buildings. The higher the level of the Senate, the quicker the construction/expansion of buildings. The Senate is also key as a certain level senate is a requirement for most other buildings. 2 Agora The agora is effectively the rally point for your city. In the Agora you may see overviews of troops inside and outside your city, as well as having access to the simulator to predict battles. You can also summon all the cultural events here (explained in section 11). 3 Farm The farm is the place which produces food so that your troops can eat. The higher the level of the farm, the more population you can cater for, which eventually means the more units and buildings you can build. You may also activate Militia here (explained in the next section). 4 Warehouse The warehouse is where resources are stored until they are needed for building/training/researching something. The higher the level of the warehouse, the more resources you may store. Note that the warehouse also has a secret chamber in which it hides resources, in case your village gets attacked by a hungry player looking to loot some resources. 5 Timber Camp The timber camp produces wood for your village to use. The higher the level of the timber camp, the more wood produced per hour. 6 Quarry The quarry produces stone for your village to use. The higher the level of the quarry, the more stone produced per hour. 7 Silver Mine The silver mine produces silver for your village to use. The higher the level of the silver mine, the more resources produced per hour. 8 Barracks In the barracks, you can recruit troops to fight for you. The higher the level of the barracks, the quicker the troops will be recruited. As well as this, a certain level barracks is required to build certain troops. 9 Academy In the academy, you can research new technologies that will help you progress the game. The higher the level of the academy, the more technologies you may research and discover. The academy is a key building, as it unlocks the key researches needed to get new cities. 10 Wall The wall fortifies your city and gives troops in your city a defensive advantage. The higher the level of the wall, the better the defence of your city. Note that you can also see all the troops you've killed and lost by clicking on the wall. 11 Cave The cave is where spies can be assigned to scout out enemy cities. You store silver here so that you can pay for their services (section 8). The higher the level of the cave, the more silver you can store. 12 Harbor The harbor is where you can build new ships to explore the ocean. The higher the level of the harbor, the quicker the naval units are constructed. The harbor is key to the progression of your empire. 13 Temple In the temple, you can worship the god of your choice. The higher the level of the temple, the quicker divine favour is produced (explained in section 9). 14 Marketplace Through the marketplace, you can send resources to allies as well as trade them. The higher the level of your marketplace, the more ability to trade you will have and the more you will be able to trade. You can look at the city overview of any of your cities without having to move the map. This makes it easier to know what is needed in each city without having to wait for the map to switch to that city each time. As your city grows and expands, the city overview will reflect those changes in the way you city is presented. The default name for all cities when a player begins is X's City. Not the most attractive name or most creative. However if you want to change the name of the city, just double-click on the banner with the city name. You can change the name of the city to anything you like, so long as it is within the rules of the game. Once you have decided on a name, type it in, and click the down arrow to the right of the name to save it. 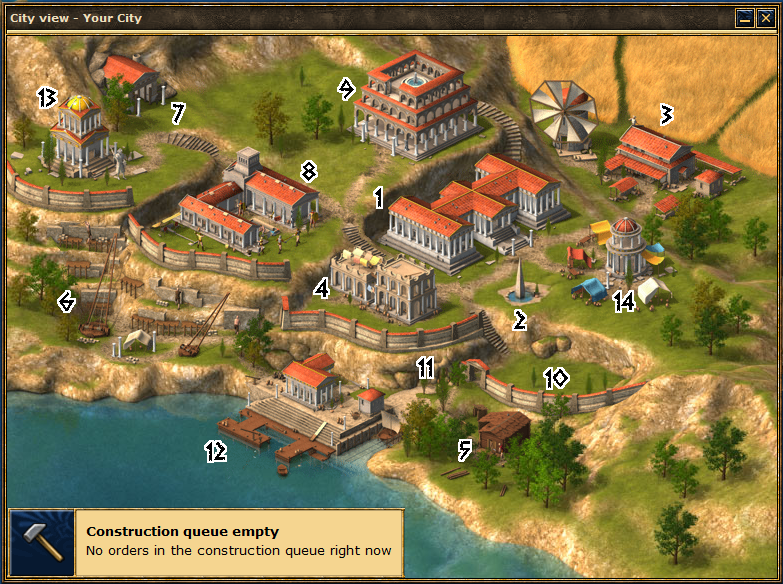 Construction of or expanding a building takes place through the Senate, or you can use the hammer icon in the lower left of the City Overview screen. If you have the Administrator active you can use the Buildings Overview to build, expand, or demolish buildings in your cities. The more levels you build, the more resources it will cost to continue expanding and it will also take more time to complete. However, there are many buildings which require others to reach a certain level before you can begin building it. You can view more information about this in the Buildings Portal. Training military units will be one of the main objectives for each of your city once it is fully built. The Barracks is where you will train all of your land based units, and the Harbour is where you will train your naval units. Every military unit, with the exceptions of the Swordsman and Transport Boat, will require their respective technology to be researched. In order for some of the technologies to be researched, you will need to expand the Barracks and Harbour to the appropriate level. Horsemen require that the Barracks is built up to level 10 before you can begin researching the technology for that unit. Colony Ships require the Harbour to be at level 10 before you can research that technology. The other exception to this is with Mythical Units as they only require that you have built a Temple to the correct level and chosen a god to worship. Mythical units have many advantages and are much stronger than regular units, but their resource costs are quite high, making it difficult to recruit a large number of them at a time. For more information about the various military units in the game, see the Units Portal. In addition to the other cities on your island, there are 8 Farming Villages as well. These villages can provide your city with resources in the form of tribute and troops. In order to make use of the resources that they can offer you must first conquer them and bring them under your control. Once this is done, you can gather resources from them at your own leisure. For detailed information about gaining resources in this manner, please see the Farming page. The main goal of Grepolis is to become a major military force in your world and to earn the fear and respect of your enemies and allies. Only by making your mark on the world can you hope to be elevated to the status of a Hero and gain the favor of the gods. This page was last modified on 21 August 2017, at 04:22.